The Johns Hopkins University Institute for Computational Medicine is seeking highly qualified applicants for its full-time master’s degree programs. Please join us to learn more! Register here. Gain insight into our program and admission requirements. Hear about faculty research related to computational anatomy, computational molecular medicine, computational physiological medicine, and computational healthcare. Hear from students and gain insight into what life is like as a Johns Hopkins engineering student. 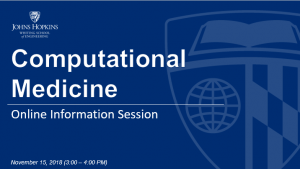 Have your questions answered by Computational Medicine faculty and students. As valued members of the Institute for Computational Medicine, our graduate students work alongside our world-renowned faculty members who are performing cross-disciplinary research and developing solutions that address the critical challenges pertaining to the diagnosis and treatment of human disease through applications of mathematics, engineering and computational science.